With the economic downturn, and with the price of top-end spotting scopes heading north of $3000, many birders are looking for something that fits a modest budget. This article reports our testing of 12 scopes priced under $900. The scopes fall into three major groups, based on objective lens size: five sub-compact, 50mm scopes; four compacts of 60 to 70mm; and three full-sized, 80mm scopes. We mounted the scopes outdoors on tripods, at a midrange distance of 75 feet from the target. The target was a standard USAF 1951 Resolution Test Pattern composed of a series of progressively tinier groups of lines, each with an identifying number for quantifying the results. We set all the zoom eyepieces to 30x magnification, for a fair comparison. We also measured resolution at 60x where appropriate. We tested at various times of day and under various lighting conditions. This was easy, since we live in the Midwest, where it's said, if you don't like the weather, just wait an hour. We set up a high-end reference scope, a Zeiss Diascope 20-60x80, that tested at the top in previous reviews. As we took resolution readings on a scope, we could check back with the Zeiss to make sure we were looking at the limits of the test scope, not the limits of our eyesight. The results of the 30x and 60x resolution tests appear in the chart, mapped so that the Zeiss reference scope would score 5. 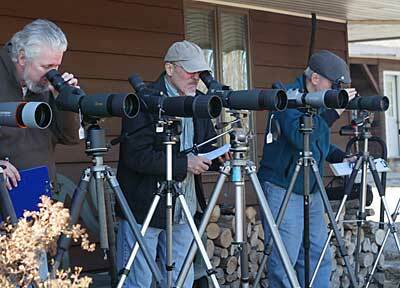 We invited local birders for a test day. They rated the scopes on optical quality, focus knob, and ergonomics and made detailed comments on each scope. Their scores are averaged in the accompanying chart, and many of their comments appear in the individual reviews. We have summarized our findings in a numerical way, with the highest scorers at the top of each category. See Mid-priced Scopes Ratings Chart 2009. The links below will take you to our remarks on individual binoculars in the survey. In the list below, they appear below in alphabetical order by the name of the manufacturer. We learned a lot. The Nikon Fieldscope showed us that small really is beautiful. The Alpen showed us that there are some surprisingly good values out there. The Pentax showed us you can get a good 60-power image even in a 65mm scope. And the Yukons showed us that for $100 or less, you can get a usable birding scope. All this reinforces what we already knew about birding gear. Even a small investment can return a priceless amount of fun. See The Scopes Advisor for specific, name-naming advice and reviews on scopes that are popular with birders. Read what Michael and Diane recommend as the best scope in various price ranges. The Tripod Advisor provides a quick overview of what you need in a tripod to use with a spotting scope. Then it offers specific name-naming recommendations to meet specific needs. This article appears as part of the Mid-priced Scopes Review in the May/June 2009 issue of Bird Watcher's Digest.